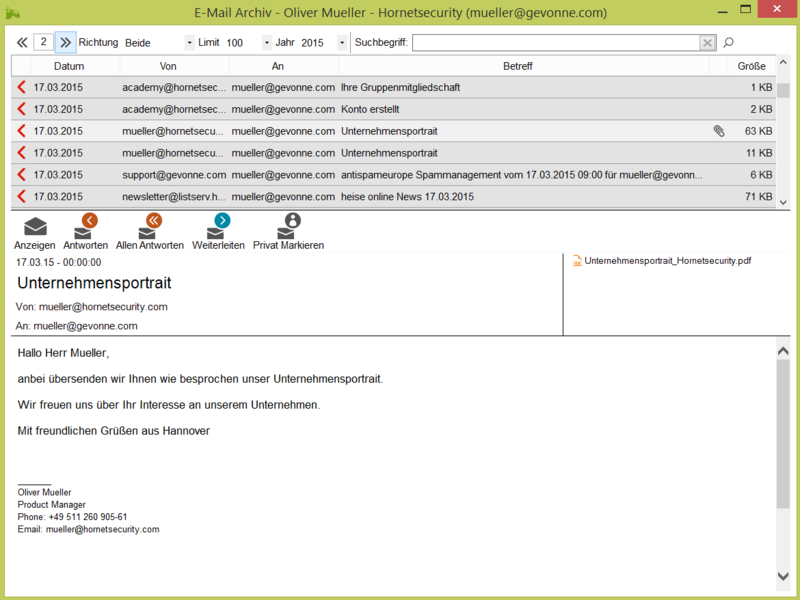 Hornetsecurity provides fully automated and secure email archiving. Businesses looking for cost effective, easy to use email archiving. Large organisations looking for advanced archiving of all business communications data. No compromises fully automated, 100% archiving at affordable costs. 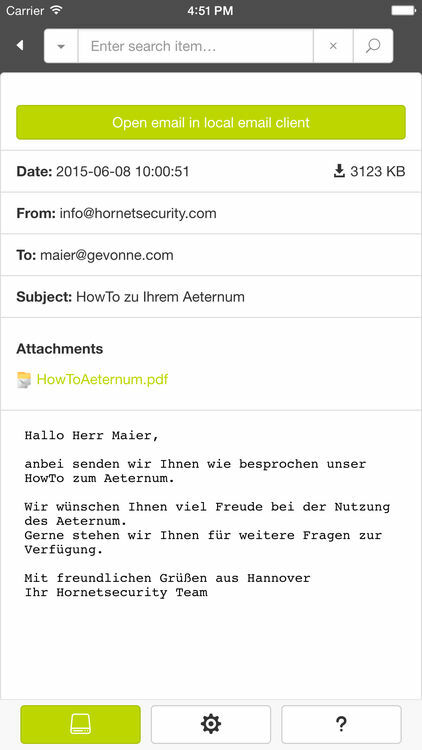 Legally compliant and audit-proof archiving of emails without administration effort but easy access to the data - thanks to Hornetsecurity Aeternum. Hornetsecurity offer an email archiving solution that makes sure all emails are stored securely, encrypted when moving between servers, to ensure full legal compliance. Emails are archived automatically and retrieving them in small numbers is easy. The search function allows you to search for full text terms, and then refine them to find the specific emails you are looking for. Emails cannot be edited or deleted in the archive, and there are options for admins to only be able to view email meta-data rather than the contents of personal email. This can also be applied to third party auditors, if they need to check email communications. All emails can be removed in bulk from the archive at any time, although this can potentially incur large fees. 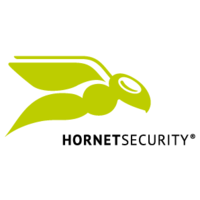 Hornetsecurity archiving is an easy to manage and cost effective service. It’s particularly suited for small businesses, with a focus on security, compliance, and ease of use. There are a few missing features, such as the fact end users can only access their own archive through an app, rather than within their existing web client. Overall though, this is a good choice for small businesses, especially in Europe, looking for secure and easy to use email archiving. The ease of use and deployment also makes it a good option for MSPs and VARs.